Last summer I was taking an old, best friend around my house in Virginia, showing her the stuff hanging on the walls. We came to the picture above and I said, "It's been in my father's family in California for a long time. It's supposed to be Australia." We peered at the idyllic early spring scene of gum trees, people out for a jaunt on horses, and one guy washing his pig in the river. My friend, who's used to looking at old things, said, "Turn it over. Maybe there's some kind of inscription on the back that will tell you what it is." We did and, sure enough, underneath the crumbling paper backing, there was something written, in a loopy, very old handwriting. I looked more closely at the picture -- for the first time in my life -- and realized that it was not a print, as I'd assumed, but a watercolor. Which meant it was unique. Hmm. When I and my siblings were dividing up my parents' things after they died within two months of each other in California in 2006, I was the only one who wanted the picture -- and that was mainly because of the handsome frame. I looked now in the lower left corner and saw this hand-scribbled notation: STG/44. If it wasn't a print number, it was maybe the date. 1944 didn't make sense. But 1844 would have been around the time William Chard, my great-great-great grandfather, a ship captain from London, stopped with his brother-in-law for a few years in Australia before heading off to San Francisco in time for the Gold Rush. I took the watercolor to Wayne, our local framer, and he scanned the inscription so I'd have a record of it after he covered it up with new backing (I still can't make out what it says). Wayne said, "Whoever did this was a trained artist. The bridge is very nicely done." I was hooked. 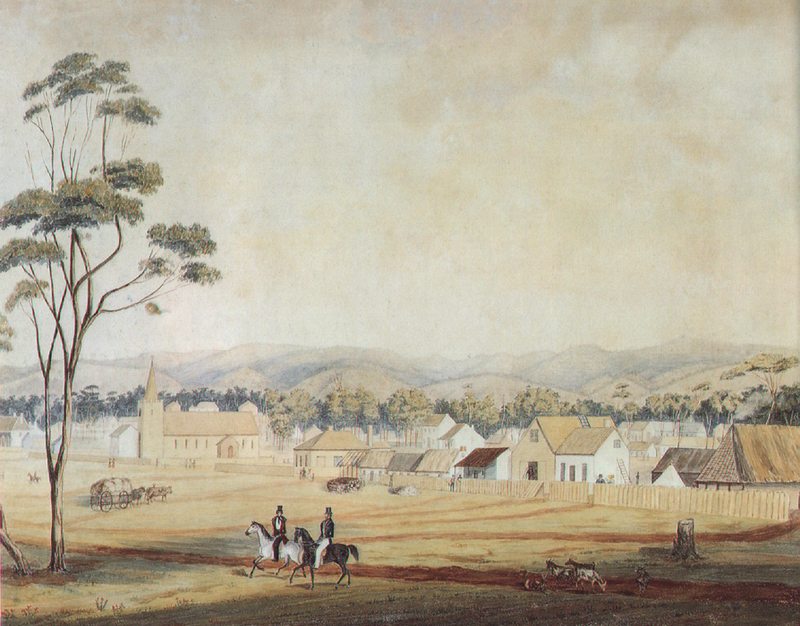 A Google search revealed that the initials were inked by S. T. Gill , Samuel Thomas Gill, another Londoner who had come to Australia in the late 1830s to make his fortune as an artist, painting people, their houses and local scenes like this. Later, he would make his name doing watercolors of the Australian gold rush. Living my very own Antiques Road Show, I needed to find out which Australian place the picture portrayed. And the value. My friend's son-in-law knew an art dealer in Sydney. We exchanged emails and I sent photos of the picture, with close-ups of the signature. The dealer got right back to me. Gill's work is sought all over the world for its grace, skill and documentary value to Australian history. 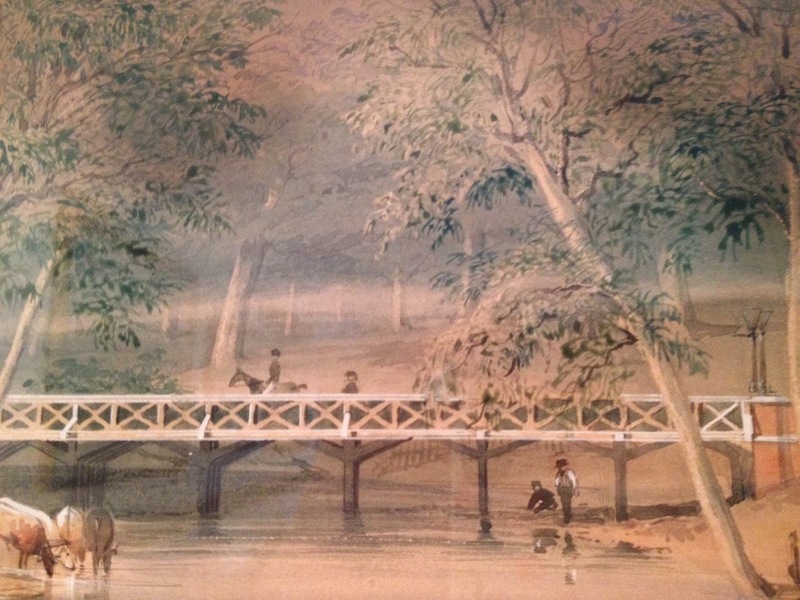 The picture, he said, is of Adelaide, of what was at the time the Frome Bridge, from the west side, across the River Torrens. Gill's first studio was in Adelaide. The bridge was named after Edward Frome, the Colonial Surveyor-General at the time. But, like most of the bridges across the Torrens, it was washed away when the unpredictable water got high and fast, "a memento," according to the terse judgement in the above link, "of the uselessness of good brickwork founded upon unsubstantial piling." So much for that pretty bridge. 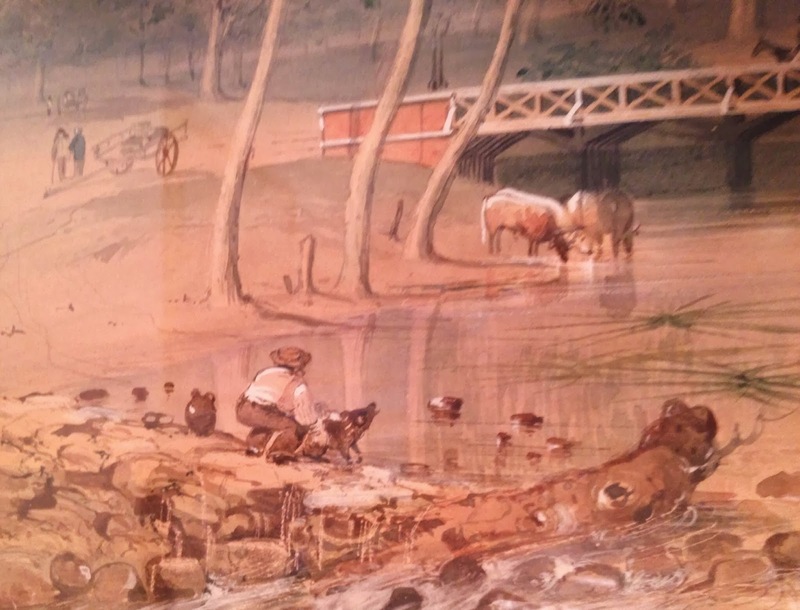 The National Library of Australia in Canberra has another version by Gill of the same river scene as mine. It's undated, but thought to be later, circa 1846. The dealer told me that Gill often repeated popular subjects, but that my picture was better than the National Library's -- and dated. Plus, the beautiful wooden frame is original, he said, another rarity. 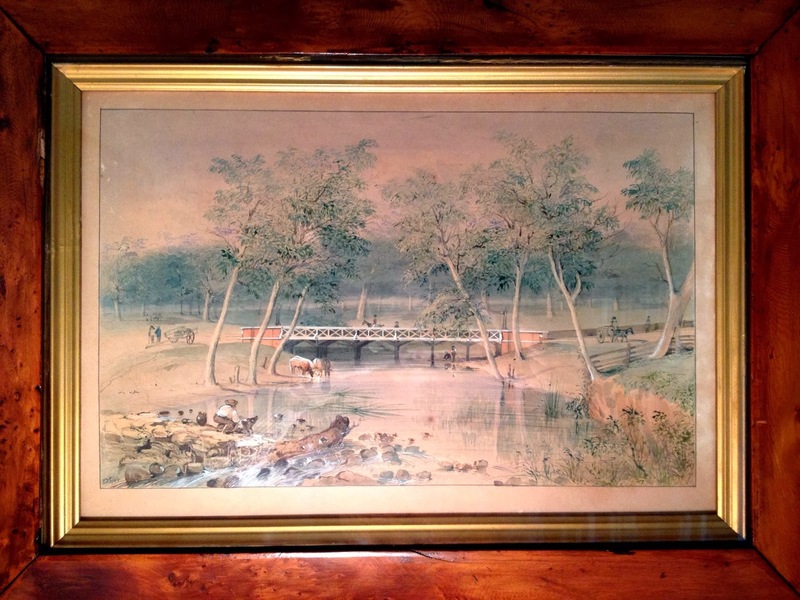 My early family must have bought the watercolor as a souvenir of their time in Australia, got it framed to keep it safe, and carried it with them on their ship that sailed across the Pacific, via Hawaii, to the chaotic port of San Francisco in 1849. It survived the 1906 earthquake and fire in that city -- though their house, built on Sutter Street of wood they'd brought from Australia in the hold of the ship, did not. Had my ancestors loved that other new country? Were they sad to leave? Did they have a sense of humor that liked the detail of the man washing his squealing pig in the river? Were they excited, fearful to arrive in crazy California, gripped by Gold Rush frenzy? What kind of courage, optimism and imagination did it take for them to travel the planet like that? I held the picture in my hands. My head and heart spun with a deep time-travel vertigo. From Adelaide, to San Francisco, to Chico, to Berkeley, to New York, to Los Angeles, to Walnut Creek and now to Virginia -- this thing has been in my family for almost 170 years. Yet it took a friend from this new century to get me to look at what was right in front of me. The picture's value? Let's say it's worth in the tens of thousands. Will I sell it to the eager dealer in Sydney? No. Here's one definition of the word "precious": of great value; not to be wasted or treated carelessly. How could I sell something that was once so precious to the people who made me who I am? Instant Gratification: "The Epic of Australia's Founding"
You've read the Hare with Amber Eyes and also Aesop's Mirror: A Love Story? No, but I just ordered both! These treasure-hunt-time-travel stories are the best. Thanks, Marilyn!